Rabbi Mordechai Tzemach Eliyahu was a great rabbi and Posek. He served as the Sephardic Chief Rabbi of Israel from 1983 to 1993. He was one of the most popular and charismatic rabbinical leaders in Israel for decades. Rabbi Mordechai Eliyahu was born in the old city of Jerusalem in 1929. The family originally hailed from Bagdad, Iraq. Rabbi Elias Eliyahu, Rabbi Mordechai Eliyahu's grandfather, had settled in Jerusalem, but due to his involvement in Arab national resistance against the Ottoman Empire he was exiled by the Ottoman rulers. Rabbi Elias Eliyahu and his family subsequently moved to Baghdad. Rabbi Mordechai Eliyahu's father, Rabbi Salman Eliyahu (1878-1940) was a renowned scholar and Kabbalist and student of the Ben Ish Chai. 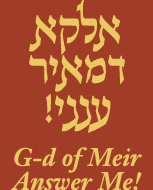 Rabbi Mordechai Eliyahu's mother, Mazal, was a granddaughter of the sister of the famed Ben Ish Chai of Bagdad (1835-1909). Rabbi Salman Eliyahu moved to the United Kingdom from Iraq and studied theology & philosophy. Due to the Western education he received in England, Rabbi Salman Eliyahu served as the personal secretary to Lord Herbert L. Samuel, the High Commissioner of the British Mandate for Palestine. Upon the advice of his mentor the Ben Ish Chai, Rabbi Salman Eliyahu moved back to Jerusalem. Rabbi Mordechai Tzemach Eliyahu was recognized as a prodigy at a young age. He studied with his father, and under his influence he developed a passionate love for Torah at an early age. Rabbi Mordechai Eliyahu was only 11 years old when his father passed away. He continued studying diligently under great scholars, such as Rabbi Ezra Attiah (1885-1970), the head of the Porat Yosef Yeshiva in the old city of Jerusalem; Rabbi Tzadka Chutzin (1876-1961), one of the great Rabbis of Jerusalem; and Rabbi Avraham Yeshaya Karelitz (1878-1953), the famous luminary of Bnei Brak and author of the Talmudic classic Chazon Ish. Each of these teachers inspired in him strong faith and trust in the Almighty, and love of the Torah. Rabbi Mordechai Eliyahu graduated with honors from the Institute of Rabbis and Religious Judges, under the direction of Rabbi Yitzhak Nissim (1896-1981) the Sephardic Chief Rabbi of Israel. His devotion to his studies led him to be the youngest person elected to the post of Religious Judge (Dayan) in Israel. He continued to excel as a Dayan for four years in the religious court of Beer Sheva before transferring to the religious court in Jerusalem. Here, he was elected to the Supreme Religious Court. The general public grew to know him as a reliable source to solve problems and answer difficult questions. His warm manners and grace, coupled with his vast knowledge of Torah, helped him be elected to the post of Sephardic Chief Rabbi of Israel (Rishon L'Tzion). Rabbi Eliyahu served as Israel's Chief Sephardic Rabbi from 1983 until 1993, together with the late Rabbi Avraham Shapira (1914-2007). These two Torah giants, who were close friends, continued to lead the national-religious public in matters of Jewish Law and philosophy for many years, even after the end of their official terms in office. As Chief Rabbi, one of his focuses was to reach out to secular Israeli Jews, giving them a better understanding of Jewish customs and the importance of the Torah. He lectured at secular moshavim and kibbutzim, as well as non-religious public schools. He also traveled extensively throughout the world, teaching Jewish communities the importance of stamping out assimilation, increasing Shabbat observance, providing children with religious education, and observing the laws of family purity. Rabbi Eliyahu helped Jewish communities all over the world through his teachings, his books and his popular weekly televised lecture in his Synagogue. His books include: Path to Purity, which is available in over five languages, Halachot Moed, which lists the different laws for each holiday, and he edited the daily prayer and Holiday prayer books, giving the pertinent laws before each prayer or section. One of his most important works was his annotations to the Kitzur Shulchan Aruch of Rabbi Shlomo Gantzfreid. This book is praised for its clarity and conciseness. It is used in classes of students from varying backgrounds, thus uniting the Jewish people. Rabbi Eliyahu was much sought after due to his expertise in Torah and Halacha and for his tremendous piety. For years, Rabbi Eliyahu would sit in his Kiryat Moshe Synagogue each day answering hundreds of legal questions and dispensing advice to the endless streams of people of all stripes who sought to profit from his wisdom. Rabbi Eliyahu and his wife Rabbanit Tzvia Eliyahu were devoted to helping Jewish people everywhere both spiritually and emotionally. They were also very active in charity organizations such as Rabbi Meir Baal Haneis Salant. Rabbi Eliyahu headed the Keren Moreshet network of Torah groups that settled in various cities throughout the country. He worked for the preservation of Iraqi Jewish rites and customs and the opinions of the Ben Ish Chai. He published a prayer book called Kol Eliyahu based on this position. Rabbi Eliyahu and his wife Rabbanit Tzvia Eliyahu have four children, one of whom, Shmuel Eliyahu, is the Chief Rabbi of Safed. Rabbi Eliyahu suffered from a heart condition. On August 24, 2009 he collapsed in his home and was rushed to the hospital. The sage was in pain for many months. His wife, Rabbanit Tzvia Eliyahu, recently related that her husband had told her that he was prepared to suffer personally if only he could only save the Jewish people from suffering. Rabbi Eliyahu died almost a year later on June 7, 2010 at Shaare Zedek Medical Center from complications related to his heart condition. An estimated 100,000 people attended his funeral in Jerusalem. He is buried on Har Menuchos near the tomb of the holy sage Rabbi Chaim Yosef David Azulai (1724-1806) known as the Chida. May the memory of the great sage Rabbi Mordechai Tzemach Eliyahu be a blessing to all the Jewish people.